We are proud to announce Senior Horticulturist Shannon Smith as the recipient of the Frank L. Robinson Endowed Chair. 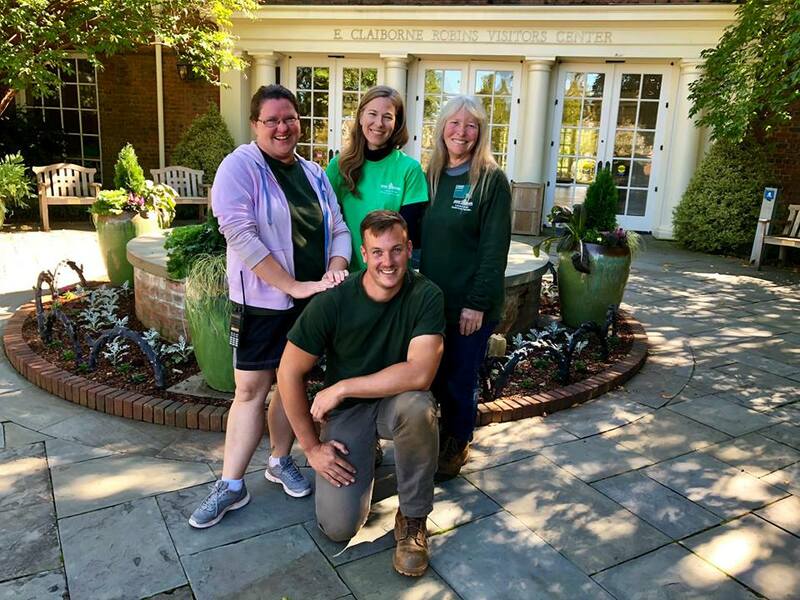 Shannon Smith (in light green shirt) with three other Frank L. Robinson Endowed Chair applicants: Youth Programs Developer Heather Veneziano (left), Rose Garden Horticulturist Laurie McMinn (right), and Horticulturist Dean Dietrich. The Frank L. Robinson Endowed Chair, created in 2015, honors the Garden’s President Emeritus Frank Robinson. The Endowed Chair offers compensation, professional development, and position support to a selected staff member from either horticulture or education. The Garden’s Executive Director Shane Tippett said that Shannon Smith “took a careful and thoughtful approach to the task at hand” and that she “sees what others don’t see” making her proposal stand out, but notes that with so many deserving applicants, the decision wasn’t easy. Director of Horticulture John Morse explained that Smith’s proposal focuses on an important topic that will help continue to move to the Garden forward: innovative design. Smith’s proposal seeks to incorporate new planting designs by blending creative design ideas and practical solutions to implement Lewis Ginter’s permanent plantings and seasonal displays. She will get the chance to travel around the United States to meet with top designers from other public gardens. While doing so, she’ll be researching how other public gardens implement design into their gardening process and will hopefully be able to bring back fresh ideas and instill some of those key aspects into our Garden as well. Smith will focus her effort on collaboration among the Garden’s staff between departments and creating professional development opportunities for fellow horticulturists who show a potential for design. In addition, Smith will introduce more interpretive signage to highlight different design elements. Smith, one of three Senior Horticulturist at Lewis Ginter Botanical Garden, started in 2002 as a temporary, seasonal, gardener. In 2004 she became a horticulturist working in the Woodland Walk and Central Garden areas. In 2013 her area of responsibility moved to the Asian Valley. Smith was also the first coordinator of Dominion Energy GardenFest of Lights and held that position for five years. Smith is currently responsible for Lewis Ginter’s plant records and labeling. She says that winning this award is an honor and she knows that there was a good group of candidates. She hopes that in the future Lewis Ginter Botanical Garden will be able to implement the other submitted proposals as well. Smith’s project will begin in April of 2019. Samantha is currently a Senior at Virginia Commonwealth University studying advertising. She enjoys all things outdoors, traveling, and photography. She hopes to one day inspire others to enjoy nature just as she does and to help others understand the importance of conservation and preserving our National Parks.